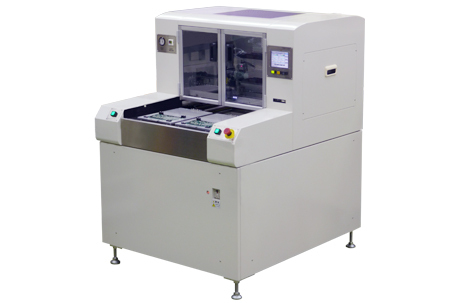 Twin working table are alternately cutting, it is possible loading and takeoff PCB work during another table cutting. User friendly drastically improved display function by use of touch panel. Create and edit cutting data based on CAD(DXF) data. Start up the teaching application on the PC and then just click somewhere you want to cut on PC screen. 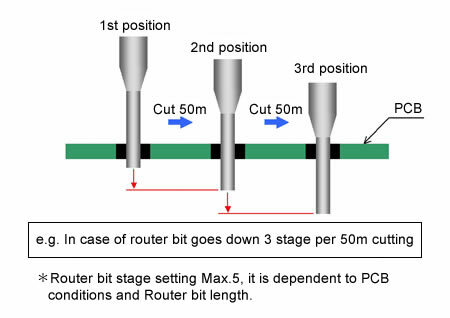 Reduced running cost with the function of Z axis height multistage-auto-changeover by router bit life(count cutting sheet or distance) management. Automatic select cutting program with JIG BIT system from program to prevent operator mistake (Option). Prevent product failure by detection of router bit drops and broken. 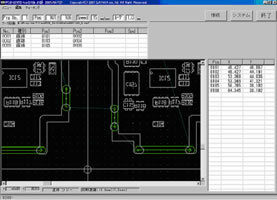 Easily create cutting program even there is no PCB CAD data with the use of TEACHING CAMERA(Option).